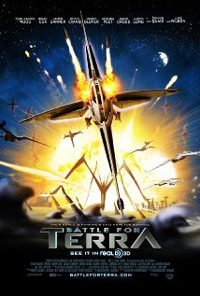 The planet of a peaceful race is invaded by a hostile force. The attackers are human, having made their own planet and others they tried to populate, uninhabitable. A crash landed pilot is hidden by one of the alien planet's natives, and she comes to learn the humans' intentions, but also some revelations of her own people. With the human forces heading in for a deadly showdown, allegiances need to be forged to fight for what is right. The familiar theme of destroying nature and each other, the need to co-exist etc. is front and center. The digital animation is by no means inferior, but not as high quality as the huge Disney and Pixar productions. Made as a 3D movie, naturally the main intension falls by the wayside somewhat with its 2D version on DVD.